Archaeological findings prove that in the 6th century BC the ancient Greeks had commerce with the Illyrian by means of the sea, and that they founded their colonies there (Pharos, today’s Starigrad, on the islands of Hvar and Issa on Vis). and they not only built palaces and summer residences but they also spent a considerable amount of time on the sea, and there are many underwater findings located between Pula and Cavtat which show this to be true. Such findings are mainly amphorae, which were at the time commonly used for storing everything from wine to wheat, oils and perfumes. Wherever you choose to go diving, you will find the remains of Antique ships and their cargoes. One of the most precious findings from that time are remains of pythos or dolias, large pottery vessels which were built into ships and used to transport bulk cargo (wheat, etc). One such site is near Cavtat, while another is near Murter. A new era dawned with the arrival of the Slavs( among them the Croats), a period characterized by constant struggle for supremacy and by defense against diverse enemies. The Croat tribes came to the lands of present day Croatia in the 7th century. Ruled by various Croatian Princes, Dukes since 852, Dalmatia eventually absorbed Pannonia and after periods of nominal Eastern Roman and then Frankish Imperial rule, Croatia eventually became a strong independent Kingdom in 924. In 1102 the Croatians ended a decades-long dynastic struggle by agreeing to submit themselves to Hungarian Royal authority. By the mid-1400s, the Hungerian kingdom was gravely hurt by the Ottoman expansion as much of the mountainous country now known as Bosnia and Herzegovina fell to the Turks. At the same time, Dalmatia became mostly Venetian. Dubrovnik was a city-state that was firstly Byzantine (Roman) and Venetian, but later, unlike other Dalmatian city-states, it became independent as the Republic of Dubrovnik or Ragusa, even if it was often under the suzerainty of neighboring powers. 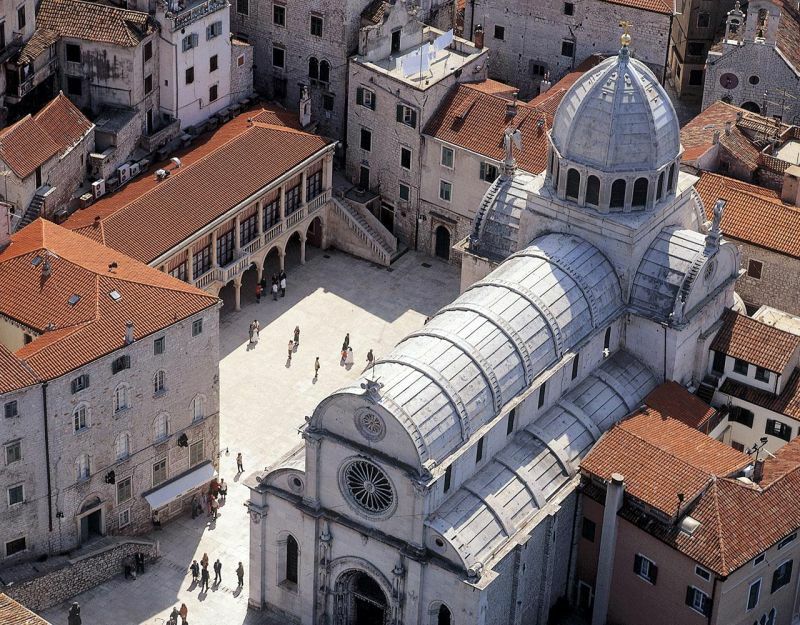 Dubrovnik, eminent in its position as a republic, played a leading role in culture and trade. A 17th-century shipwreck bears witness to those times – a galley which sailed from Venice carrying murano glass, window glass, and other valuable objects, and was fitted with cannons. But during a storm it sank near the island of Olipe, off the coast of Dubrovnik. The Battle of Mohacs in 1526 led the Croatian Parliament to invite the Habsburgs to assume control over Croatia. Habsburg rule eventually did prove to be successful in thwarting the Ottomans, and by the 18th century, much of Croatia was free of Turkish control. The odd crescent shape of the Croatian lands remained as a mark, more or less, of the frontier to the Ottoman advance into Europe. Napoleon ruled for a short period of time,( between 1797 to 1815) after which he was replaced by the Austrian monarchy. During the next hundred years, Italy and Austria fought each other for supremacy of the east coast, culminating in the battle of Vis in 1866. The Austrian fleet, led by Admiral Tegetthoff, who commanded the battleship Erzherzog Ferdinand Max, was opposed by Admiral Persano, commander of the Italian fleet. In the battle, Persano, on his flag ship the battleship Re d?Italia, was roundly trounced by Tegetthoff, and the Italian fleet withdrew in defeat. Testimony to those glorious times can be found not only on the mainland, but also under the sea in the shape of shipwrecks and remains of the detritus of great ships. The period of Austro- Hungarian rule commenced thereafter. Ports were built and fortified, trade and shipbuilding flourished. Following World War I, Croatia joined the State of Slovenes , Croats and Serbs (comprising what is today, Slovenia, Croatia and Bosnia). Shortly thereafter, this joint state in turn formed a union with Serbia to form the Kingdom of Serbs, Croats and Slovenes (which eventually became Yugoslavia in 1929). Yugoslavia was invaded during World War II and Croatia was turned into a fascist puppet-state named Independent State of Croatia. When the Axis powers were defeated, Yugoslavia became a federal socialist state. During the two World Wars, the Adriatic was one of the more important areas of battle, and there are many shipwrecks dating from those periods. Near Pula, for example, which at the time was a strategically vital naval harbour, twenty shipwrecks have been located, including a number of submarines, destroyers, and torpedo-boats. Along with Slovenia, Croatia declared her independence from Yugoslavia on June 25, 1991, which triggered the Croatian War of Independence. Belgrade rejected the new country and the ensuing months saw combat between various Croatian armed forces and the Belgrade-based JNA (Yugoslav National Army). In December 1991, Germany recognised Croatia and many other influential countries followed suit. A Serb population living in some areas of Croatia revolted in 1991 and proclaimed their own state “Republic of Serbian Krajina”. They were supported by the Yugoslav army. In 1995, the Croatian Army successfully launched two major offensives to retake the rebel areas by force, leading to a mass exodus of the Serbian population. A few months later, as a result, the war ended upon the negotiation of the Dayton Agreement. A peaceful integration of the remaining Serbian-controlled territories was completed in 1998 under UN supervision. The 2013 enlargement of the European Union saw Croatia join the European Union as their 28th member state on 1 July 2013. Since gaining independence, Croatia has been undergoing economic transition from a centrally planned economy to a free market one. Croatia has made considerable progress toward economic recovery and Euro-Atlantic integration. Its democratic consolidation is evident in the smooth transition of power resulting from the parliamentary elections of November 2003. Croatia’s principal growth sectors are: energy, tourism, construction, transportation and telecommunications. These sectors offer significant trade and investment opportunities. While many countries have been experiencing slower growth in their tourism industry, Croatia has demonstrated impressive growth in this sector. The Dalmatian coast has become a hot spot destination. In addition, there is increasing demand for environmental equipment and services to meet EU-mandated requirements. As a result, through the last successive governments, Croatia has pursued a positive position in the region through democratic reform, regional cooperation, the promotion of human rights, and through liberalizing its trade and borders.